How do you manufacture all your cosmetics and skincare? 100% of our mineral makeup is manufactured right here in our North Carolina studio. Our natural skin care formulas are responsibly sourced from a US-based alternative skin care manufacturer that produces our all-natural creams, facial moisturizers and clay masks. Southern Magnolia does not import any products or ingredients from outside the USA. We refuse to offer any products to our customers that we would not use ourselves. We are committed to bring you the best in all-natural goodness! Why are your products so much less expensive than other brands? Plain and simple, there is no middleman! Here at Southern Magnolia, we manufacture, package, label and ship all of our makeup products. We do not have expensive advertising and packaging that only adds to the cost of each product. In the grand scheme of things, who really cares about that shiny pink jar that ends up in the trash when the product is used up!! We focus on the handcrafted product inside the jar, to ensure to you are getting the best product at the best price! Will Mineral Makeup irritate my skin or make my skin itch? The ingredients in big brand makeup are well known to trigger makeup allergies. Itching, splotching, peeling and acne are just a few of the side effects of 'dirty' makeup ingredients. One example, bismuth oxychloride, is a very nasty makeup ingredient found in many major brands you are likely to find at your local drug store or department store. Southern Magnolia Mineral Cosmetics does not use Bismuth Oxychloride in any loose minerals. Our minerals are all natural, safe and good for skin. 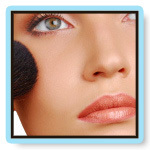 Another common cause of skin problems is bacteria growing in makeup. 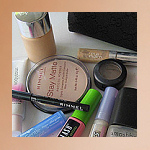 Because they are manufactured with cheap filler ingredients, conventional makeup brands tend to harbor bacteria, which can irritate skin and cause outbreaks. One of the best things about mineral makeup is that it is naturally hypoallergenic, meaning it contains no acne-causing bacteria. 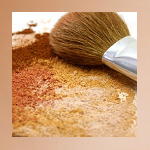 When properly stored, mineral makeup can last for years. Are Southern Magnolia Minerals safe for my skin type? Anyone can wear our mineral makeup! It is great for sensitive skin, problem skin, healing skin and particularly those with Acne and/or Rosacea. It is suitable for all skin types and is ideal for sensitive skin. The titanium dioxide is a natural sunscreen, and Zinc is a natural anti-inflammatory, healing & soothing mineral. We have many customers with Celiac Disease and Lupus who refuse to use anything but Southern Magnolia Mineral Cosmetics. Does it work for mature skin? Yes. The natural luminoscity of our exclusive mineral formulas helps refract light away from lines, pores and wrinkles, softening the look of your skin and diminishing signs of aging. Women with mature skin love our light-as-a-feather coverage. Women with oily or combination skin love the oil absorbing qualities of the minerals and their ability to maintain a natural 'dewey' finish throughout the day. We always recommend using a moisturizer or a liquid primer prior to makeup application. Velvet Veil primer is favorite amongst our customers! And you can never go wrong with our firm and facelift cream as a moisturizer. Is it good for problem skin like acne, rosacea and sensitive skin? Yes. The protective and healing properties of our natural minerals help conceal as well as heal problem skin. It is perfect for acne or rosacea prone skin, inflammatory skin conditions, and post-surgical or post-chemical peel skin as the natural minerals can reduce irritation and redness. Customers with gluten allergies, lupus, celiac disease and other health conditions that cause problematic skin love our minerals and refuse to wear any other product. Our products are non-comedogenic, so they are perfect for people who are acne prone. Zinc is also a anti-inflammatory, so some people have told us that our products seem to speed up the healing process. Is mineral makeup good for dry skin? Yes. The natural properties of our mineral formulas help retain moisture in your skin. Since our minerals are so versatile, they can be applied wet or dry, with a brush or sponge. This helps to give a natural looking coverage ranging from sheer to opaque. You will love the radiant glow of your skin after using this makeup! We highly recommend using a moisturizer prior to makeup application. Try our firm and facelift cream, or our vitamin C cream. We believe that animals shouldn't suffer and die to test cosmetics or their ingredients. Southern Magnolia Mineral Cosmetics does not conduct or commission animal testing of any cosmetics and are proud supporters of the Humane Society's International "Be Cruelty-Free" Campaign. Where does your Vitamin E come from? We do not produce a printed catalog. We always consider the environment first! Do I have to enroll in a monthly subscription or join a club? Absolutely not! We believe in letting you buy exactly what makeup you want, when you want! Can men wear this makeup? Sure! In fact we have male customers that have discovered our products and love them because our mineral foundations cover redness yet look so natural. I am allergic to other makeup brands. Can I wear Mineral Makeup? Most people should be able to wear Southern Magnolia Mineral Cosmetics loose mineral makeup without fear of breakouts. We have heard from many delighted customers who were rejoicing in the fact that they can now wear makeup! Medical Disclaimers: All of our products are handmade. We strive for color and product consistency in every batch, if not, we throw it out and start over. We list every ingredient used in our product line. Southern Magnolia is a proud member of the "Truth in Labeling" pledge. There are no hidden fillers or ingredients that we do not tell you about. Neither SMMCosmetics.com or its employees can legally give out medical advice. We can only recommend products to a customer, but it is up to the customer to investigate any claims made by a company or its ingredients. We are not physicians nor do we have any medical training, so we ask that you consult your physician with any questions on skin reactions. If you are prone to skin allergies or have questions about our ingredients please check the label and do a small patch test before using each product . If you DO experience any type of skin irritation or reaction, please stop use immediately and contact your doctor or dermatologist. How long does Mineral Makeup last? Mineral makeup last so long because a little goes such a long way. Our kits will generally last you 4-6 months or more. Plus, there is no expiration date with minerals! 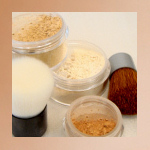 Because mineral makeup is an inorganic powder, there is no risk of spoilage or oxidization. Oh, and by the way, all of our jars are BPA-free! A 5g starter jar that holds 1 gram of minerals will last approximately 2+ weeks. Mineral blush, bronzer, mineral eyeshadow, mineral glow and mineral veil will last much longer, depending on the size and usage. Due to the intense color of the minerals, these items could last from 2-3 months up to 6 months or longer. Eyeshadows in the 5 gram starter jar containing 1g of color could lasts anywhere between 1 month to as long as 6 months or longer. How is Mineral Makeup different from "traditional" liquid and stick makeup? Large companies create liquid, pressed, stick, sponge, and other such makeup by adding fillers, preservatives, waxes, oils, etc. that allow them to make greater profits. They are obviously not concerned about your skin or what ingredients are absorbed into your body. 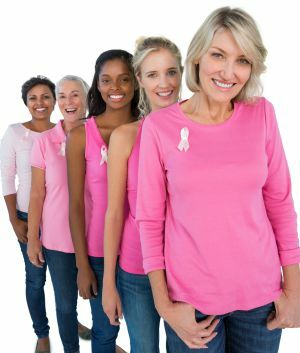 At Southern Magnolia Mineral Cosmetics, we care. We provide healthy mineral foundations and powders that contain no dyes, irritants, preservatives, waxes, mineral oil, fillers, gluten, bismuth, because we wouldn't want to put that stuff on our skin, either. Our powders are loose and buff easily into the skin. 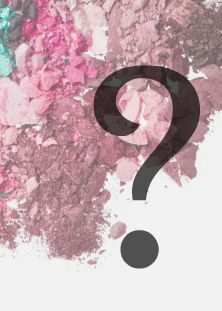 Can I use mineral makeup with my other brands of mineral powders? Yes! It is okay to mix and match powders as you desire! Is there a special technique to apply mineral makeup? Please see our makeup application techniques and tips. Everyone eventually develops their own trademark technique that makes them unique. Just follow some simple instructions for working with powder and you are ready to begin. Experiment and have fun! You are limited only by your imagination when using Southern Magnolia Minerals! Do you have an SPF Claim on your mineral makeup? We do not have one! Since protective levels depend on application, we do not have an SPF rating. We know how real people apply mineral foundation, and they all apply different amounts! With that being said, how can a company claim a certain SPF protection if Little Sally puts it on heavy with a wet brush, and Ms. Susie Q brushes on a thin layer because she wants the "no makeup" look? Our most popular foundations in the full coverage and soft focus formulas have high levels of Titanium Dioxide and Zinc Oxide, both natural sun screen ingredients. With that being said, we would much prefer our customer play it safe in the sun and wear a moisturizer with SPF under our foundation...and don't forget those shades! My skincare cream arrived melted and/or separated, what do I do? Occasionally during transit, the heat will separate skincare because we do not use chemicals or binders in our products. Simply shake well and refrigerate for several hours. This is not a sign of an inferior product. Just the price we pay for wanting healthy chemical-free products on our precious skin. 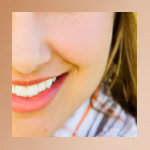 Follow the tips below to keep your skincare happy! If you are going to be out of town when your skincare is scheduled to be delivered, perhaps your post office may be able to delay shipment or an alternative pickup can be arranged. And it never hurts to upgrade your shipping method to ensure quicker transit. Because we manufacture our products in-house, we are more times than not in the lab creating, or in another area of the building working, and cannot hear the phone. 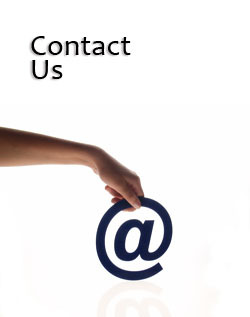 We prefer email communication, this is the quickest way to contact us. Here is our phone number where you can leave a message, 606-637-1262. But please leave a message! We are open Monday - Friday from 10 am until 4:00 pm. We do not allow walk-ins, so orders must be placed online. We are closed on weekends and all holidays. 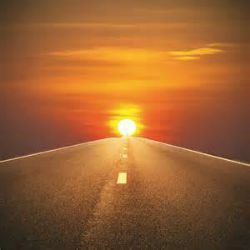 ***If you are having trouble navigating the website or checking out, first clear cookies and cache, then restart your computer. This usually takes care of it!